Some family business took me to Cincinnati this month, and guess who I saw? FIONAAAAA! She’s underwater and my phone camera is pretty lousy, but I promise that murky object is her. She’s still not on any kind of regular schedule for going outside, so it’s sort of hit-and-miss whether you’ll see her on the day you go. We got lucky. Did Cecilia write today? Yes. I made some headway on the thing I’m calling Project Not On Brand. Did Cecilia read today? Yes, The Lotus Palace by Jeannie Lin. I reeeeallly wish she would write some more Lotus Palace stories. FOUR is the number of 99-cent books by Amy Jo Cousins it took to get me to buy a full-price Amy Jo Cousins book. I rarely buy full-price books. Which maybe is not something a published writer should admit to, but the discretionary/entertainment budget is meager these days (yay, homeownership) and I’m kind of zealous about thrift even in flusher times, and also interesting-looking books go on sale often enough (plus I’m a slow enough reader) that I can usually find something cheap that I want to read. I’m more or less abstaining from twitter for a little bit, in part so I can re-jigger my brain’s balance between input and output. But I still get the impulse to share things, so for the time being I’m going to put those things here. Interviewer: What are you trying to say [with this book]? KS: It’s not so much that I’m trying to say as I’m trying to explore and understand. I liked that so much I wrote it down, and now I’m passing it along. The end. Did Cecilia write today? Yes. A little. Did Cecilia read today? Yes. I’m reading Acute Reactions by Ruby Lang and enjoying it quite a bit. Allergist heroine, restaurateur hero, Portland setting, lots of wonderful throwaway details (I’m still grinning over the image of the heroine’s office website). I was going to include an Amz link to the book, but it turns out you can actually get all three books in the series for less than the cost of any one. So if you want to try it I’d say that’s the way to go. Disabling comments because if you comment I’ll want to talk to you, and I’ll start using too much of my brain and time on figuring out what to say. I have very little brain to spare, & need to conserve it as best I can for the books I’m working on. Get UNDONE for just 99 cents! A Gentleman Undone, the second book in my Blackshear Family series, is on sale for 99¢ at all fine e-book retailers! This is my conscience-ridden-soldier-meets-ice-in-her-veins-cardsharp story, featuring tortured pasts, forbidden attraction (she’s another man’s mistress), and, possibly unique in the historical-romance canon, an explanation of the Monty Hall Problem. You don’t have to have read the first book, A Lady Awakened, for this one to make sense–hero Will is the brother of ALA‘s heroine, but he doesn’t even appear in that book (being off at Waterloo). His story starts fresh here. Read an excerpt, some accolades (RT Reviews magazine named it Best Sensual Historical Romance of 2012), and even a deleted scene at the book’s page on my website. Conference Past, Conference Future, and a Giveaway! First, have you all heard of the Historical Romance Retreat? It’s the brainchild of authors Renee Bernard and Delilah Marvelle: an all-historical-romance reader event in the posh (and historical!) Davenport Hotel in Spokane Washington next September. In a magical historical hotel setting, this weekend retreat is a book lover’s dream come true. Join some of the world’s most celebrated authors of historical romance coming together for an intimate gathering that gives every guest a chance to mingle and play. Dress in your favorite era, enjoy historical foods, games and music while surrounded by the glamour of a hotel that was once only enjoyed by the elite. A truly impressive lineup of authors will be there, from rising stars like Piper Huguley and Christi Caldwell to iconic names like Linda Lael Miller and Mary Balogh. I’ll be there too, and in between starry-eyed stalking of Mary Balogh (who gave me my first cover quote and who is also a hero of mine) and attempts to get up my nerve to ask Eileen Dreyer what it was like to be on Jeopardy!, I’ll be hoping to meet lots of readers. So if that sounds like your kind of conference, check out the registration page. Discounted early-bird rates are currently in effect! And while we’re speaking of conferences, last weekend I attended my local RWA chapter’s Emerald City Writers’ Conference. It was full of good workshops and chances to catch up in real life with online friends (in case you wondered, *Rose Lerner is just as giddy about Hamilton in conversation as she is on Twitter), and I also came home with a few books, most notably *Elizabeth Hoyt’s down-on-her-luck-actress-meets-mysterious-mute-gardener tale Darling Beast. 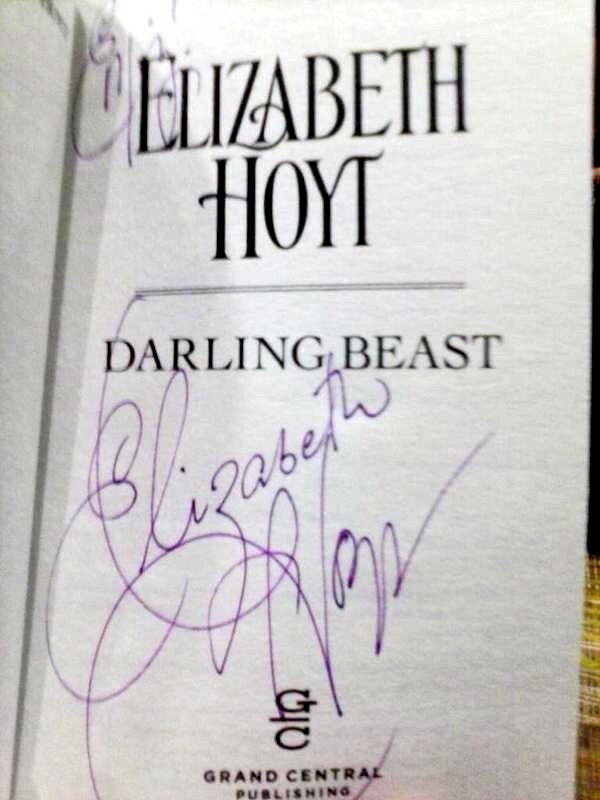 The sharp-eyed among you will have noticed the word “giveaway” in this post’s title, and indeed I’m giving away this beautifully autographed copy of Darling Beast. Leave a comment on this post (no pithiness required; “I want to win” is fine) by 11:59:59 pm Friday, October 30, and I’ll pick a winner with the help of random.org. This giveaway is open to US addresses only. You don’t need to put your email address in your actual comment, but do put it in the email field when posting your comment. That way I can get in touch with you if you’re the winner, but you won’t be throwing your email address out there for the whole world to see. Well, back in January I had thoughts of doing a post on my favorite romance reads of the year. But, as you may have noticed, I’m kind of a lousy blogger and I’m particularly daunted by posts that include graphics (e.g., book covers), because I have to re-learn every time how to get the stupid automatic borders off and how to get the images the right size and properly placed so the text flows around them and all of that. In addition, I was daunted by having to come up with something persuasive and special to say about each book, distilling for you the essence of why it appealed to me and why it ought to appeal to you. Long story short, the January post didn’t happen. AAR Honor for ACGPW… Means a Giveaway! Updated 3/3/2015: This contest is now closed. Congratulations to pophyn, chosen by random.org as winner of the three Blackshear books. Thanks to everyone who entered, and stay tuned for more giveaways! The results of All About Romance’s annual reader poll are out, and to my surprise and delight, A Christmas Gone Perfectly Wrong, prequel novella to my Blackshear Family series, was voted Best Short Story/Novella! My heartfelt thanks to everyone who voted for their favorite romances this year. 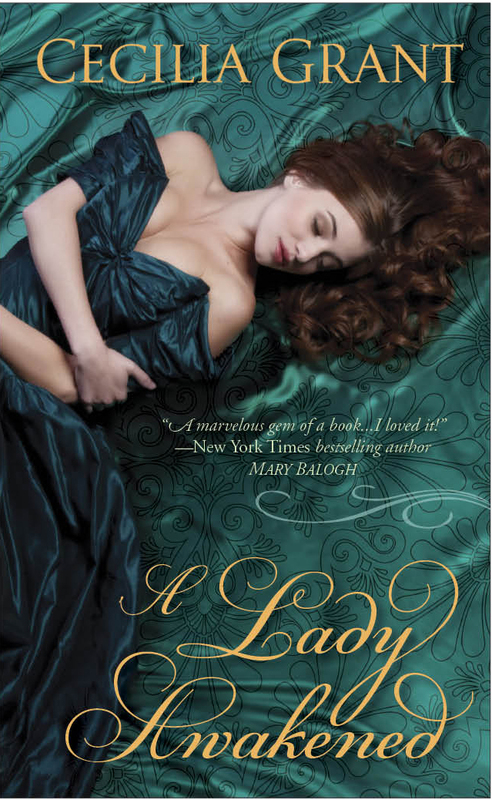 In celebration, I’m giving away a set of my three full-length Blackshear books: A Lady Awakened, A Gentleman Undone, and A Woman Entangled. The giveaway is open to US addresses. No cost or obligation. Enter by filling out the Name and Email fields below. Joining my new-releases email list is optional, and won’t affect your odds of winning the contest. Odds depend on the number of entries. Entries will be accepted until 11:59 pm Pacific time, Sunday March 1. Winner will be drawn at random and notified by email.